Utagawa Toyokuni I (1769-1825) Sawamura Genosuke as Hosogawa Katsumoto from the play Date Kurabe Okuni Kabuki, c.1808. Oban. A quite superb print by Toyokuni I of the Judge Hosogawa Katsumoto played by Sawamura Genosuke from one of the many kabuki dramas about the pantomime villain Nikki Danjo. Strikingly, in this piece, the colours remain very bold and exceptionally, the fugitive mauve remains completely intact. 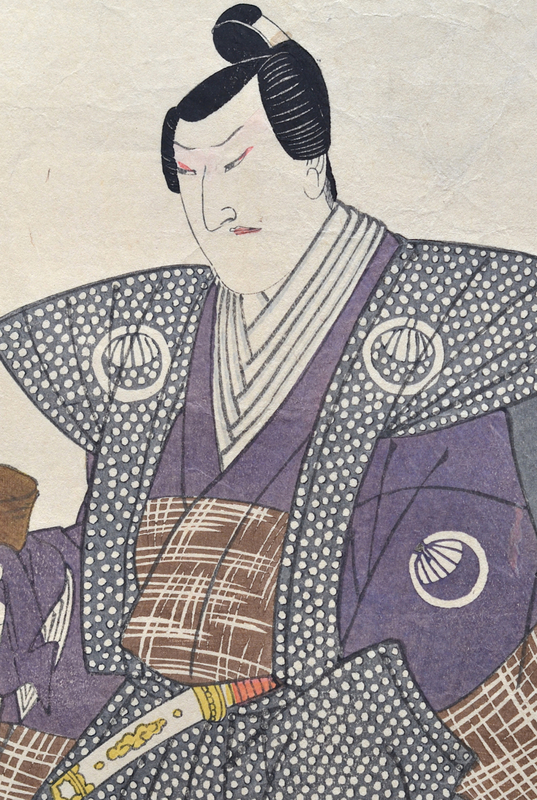 Danjo is the anti-hero of the play Meiboku Sendai Hagi, which involves the tale of a palace intrigue and real events involving the Date clan of Sendai during the 1660’s, although because of censorship over historic subject matter in the theatre, names, dates and details were changed. The child Tsuruchiyo has become head of the clan. He is kept in the women’s quarters and looked after by a nursemaid (Masaoka) for fear of assassination. The palace chatelaine and her brother Nikki Danjo plot to kill the young prince. In a moving scene Masaoka’s young son is killed in error but such is her devotion that she shows no emotion and continues the fiction that it is in fact Tsuruchiyo who lies dead. As a result she is handed a scroll with the names of the conspirators. Her true loyalty is finally discovered and a fight ensues which sees a gigantic rat appear on stage and run off with the scroll in its teeth. The final scene is a classic of kabuki drama. A servant spots the rat and attacks it; it escapes but dramatically re-emerges through a trapdoor in the hanamichi (the stage extension into the theatre audience) in the true form of Nikki Danjo and carrying the scroll in his mouth. He exits the stage as if walking magically on clouds. In this version, Danjo is brought to trial but the judge is found to be on Danjo’s payroll. The second judge, the quick witted Hosogawa Katsumoto, reveals the plot and restores justice. 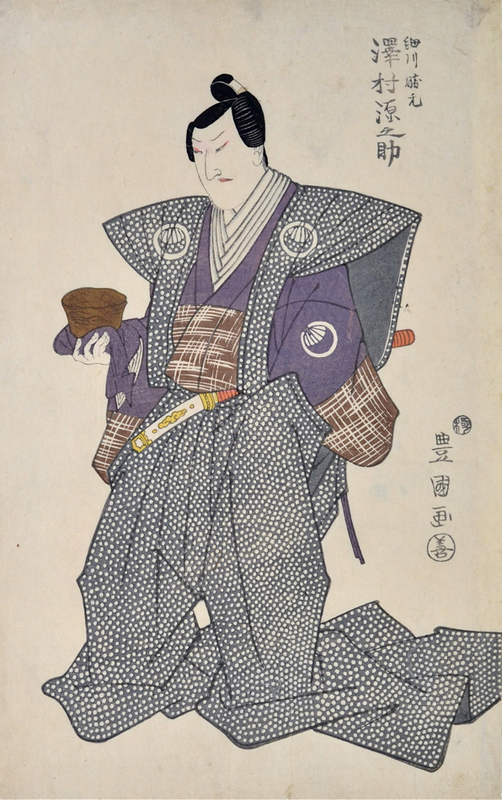 The play and character of Danjo were hugely popular with audiences and print artists. Another superb, later triptych of the play is also in the current show. This is a fine print, excellent colour, impression and condition for a print of this age.